My iPhone notes are all synced via iCloud (i guess) to my computer (mac) and shows up in the Mail.app, I accidentally deleted a very important note while in the Mail.app on my mac, now its suddenly all gone from my iPhone (since I guess it synced wireless via icloud again). How do I get it back? I have not synced the iPhone to iTunes since the note vas created and hence, I guess I cant use itunes backup to restore it. The notes iPhone can be very important data to the users. When the notes get lost by accident just like the questioner mentioned above, the iPhone users will need to try their best to recover deleted notes from iPhone on Mac. Part 1. Why Choose iPhone Note Recovery Softwareto Recover Deleted Notes? Speaking of recovering deleted files from iOS devices, iPhone users will think of restoring iPhone at first. In fact, this is the most common method to find the lost files back to iOS devices, and it is very easy to be done. With the latest iOS devices and latest version of iTunes, users are able to restore their iPhone with the iTunes backup, and iTunes will bring all the contents in the backup to your iPhone. That is to say, if you have added any data after the backup is updated, you will lose them after the restoring process. Moreover, if you have not synced your iPhone to iTunes since your note was created, you will not be able to recover it from iTunes. Of course, recovering deleted notes from iPhone can also be done with iCloud. If the users have enabled iCloud on their iPhone, they are able to restore their devices with the iCloud backup. Users only need to tap the “Restore Backup” button in iCloud on their iPhone, and then they are able to restore their devices. iCloud will ask users to erase all contents and settings before the restoring process, and then it will recover all the contents in the backup to your iPhone. Of course, you will also lose the newly added data after restoring your iPhone with the iCloud backup. Besides iTunes and iCloud, the iPhone data recovery program will also be helpful for recovering deleted notes from iPhone 6. Even on a Mac computer, this kind of program will work perfectly. 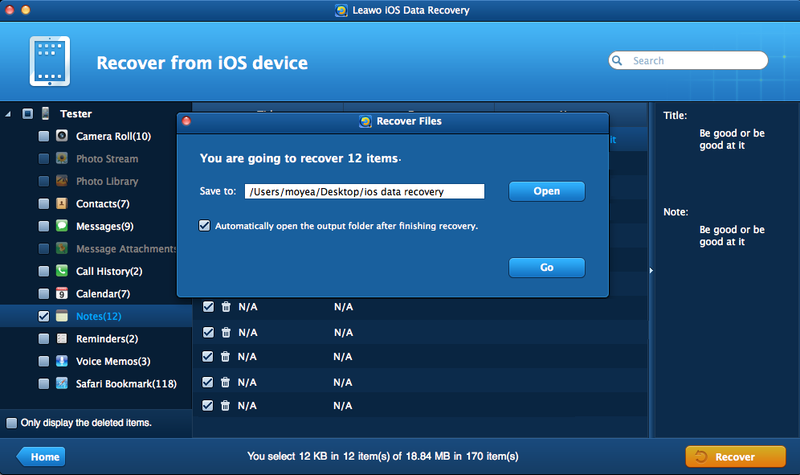 Among all the data recovery programs for iOS devices, Leawo iPhone Note Recovery for Mac is regarded as one of the best. This software is used for recovering deleted files from iOS devices and iTunes backups, and it will export the recovered files to computer in viewable files. The following guidance will show you how to recover deleted notes from iPhone on Mac, and you can free download the software to have a try. Note that the trial version will stop at the preview window. 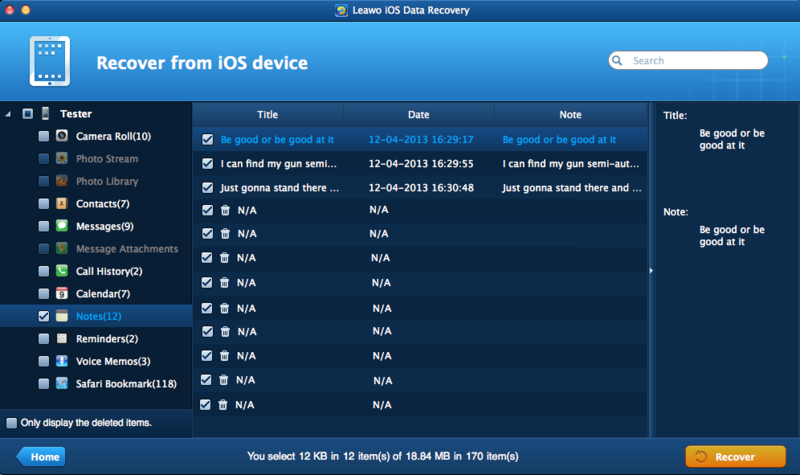 Run Leawo iOS Data Recovery on computer, and you will see two recovery modes in the main interface. One is “Recover from iOS Device”, and the other is “Recover from iTunes Backup”. Choose the former recovery mode and connect iPhone to computer with the USB cable. The software will recognize and analyze your iPhone. When the analysis of the iPhone is done, Leawo iOS Data Recovery will scan the contents in your iPhone. Choose “Notes” when the scan is finished, and check “Only display deleted items” at the left bottom. The deleted notes will show up in the right part of the window. Choose the notes you need and click the “Recover” button at the right bottom. After clicking the recover button, you will see a pop-up dialog. Click “Open” in the dialog to choose a folder on your computer to save the exported files. Then click “Go” to start recovering deleted notes from iPhone. When the recovering process is finished, you will get the recovered notes in the target folder. The notes will be saved in an HTML file, and can be viewed on your Mac easily. 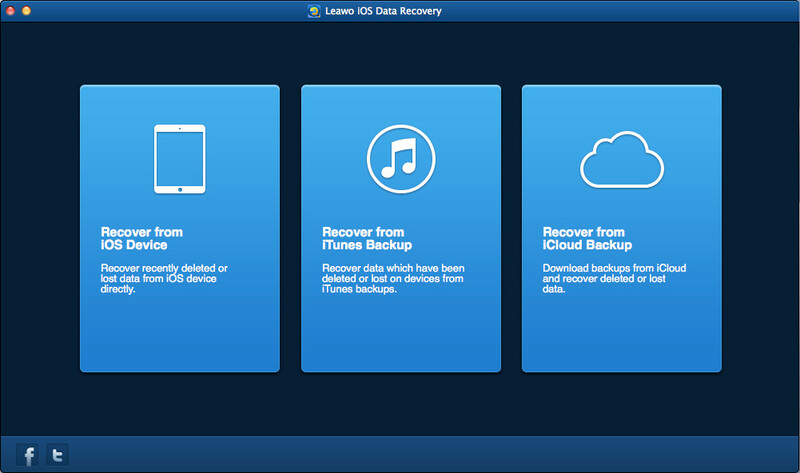 Run Leawo iOS Data Recovery for Mac, and you’ll see the 3 recovery modes in the main interface. Choose “Recover from iCloud Backup” in the window. The software will ask you to log in iCloud with your Apple ID. Enter the Apple ID and click the Enter button (Right Arrow in a Circle), or hit Enter on your keyboard to move to next step. The iPhone data recovery software will scan the backup(s) in your iCloud and display one backup in the main interface. Double-click the backup or click “Download” at the right bottom to scan the iCloud backup. When the software finishes downloading the iCloud backup, it will start scanning the contents in the backup. When the scan is done, you can choose Notes library in the left sidebar, and then check the files in the right part to extract. Then click “Recover” at the right bottom to move to next step. Click Open in the pop-up dialog to choose a folder on your computer. Then click Go to recover deleted iPhone notes from iCloud backup on Mac. When the recovering process is done, you will get the notes in the target folder. The notes can be imported to your iPhone again with no efforts. All these two methods are helpful for the users who want to know how to recover deleted notes from iPhone on Mac. If you come up with the loss of notess in your iPhone, just check these methods out. Leawo iOS Data Recovery is also helpful for backing up iPhone, iPad and iPod touch files to computer, for example, you can back up voice memos from iPad to computer with this software. Check it out if you are interested.